Today was a rough day. I started orientation and it was beyond stressful and intimidating. I can be really sarcastic and snarky, but I also have an excited/peppy side of my personality that served me well in my thre years as an orientation leader at Loyola. The people at Towson did not possess this quality. The only cure to my anxiety over being told that I’ll probably cry every day and hate my life was a long session at the FAC (Loyola’s gym, which I’m obsessed with and returning to to teach Body Pump) and then the rest of this pie. They basically said it would be the worst four years of my life and then tried to make up for it with a Helen Keller quote. I did not lick up the rest of these graham cracker crumbs. I did win a prize for knowing everyone’s names. (Another orientation leader skill). This backfired, though, because everyone else in the room only knew like half of the names so I looked like a huge creep. Oh and also my prize was a massive textbook that I was told I’ll never need for any of my classes. Thanks!!! I will be selling it on eBay or peddling it on the street for money because I’m poor from becoming a Maryland resident and paying for the crap parking at Towson. 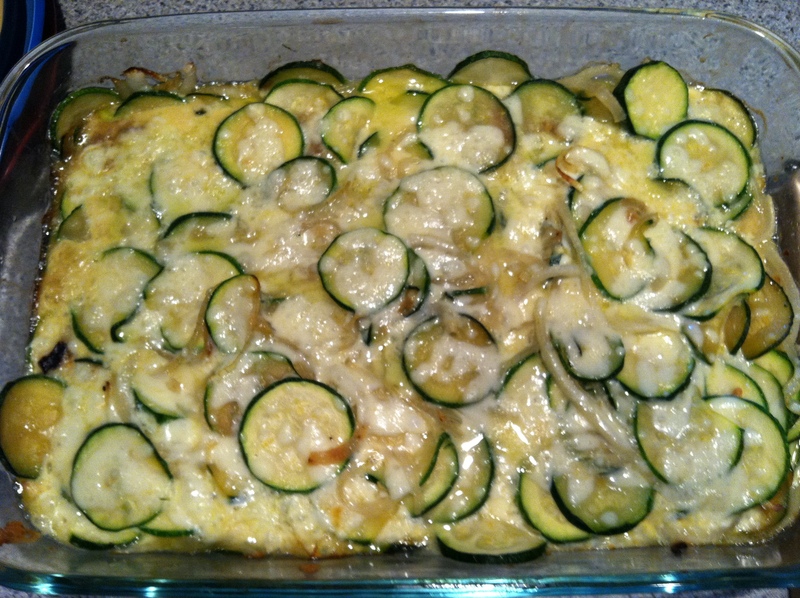 Anyway, onto the recipe for this post: zucchini casserole. If you’re in a bad mood today too, make this. I know it doesn’t look very pretty but it’s delicious. And it’s a recipe from the one and only Alice Hale, my fabulous grandmother who makes a mean chocolate sheet cake and special Christmas rolls (I’ll try to supply you with those recipes in the future). So just make it. Yesterday when I was at the grocery store stocking up on all the essentials I made sure to get everything to make this because it just screams comfort food. And it has vegetables in it so the calories from butter and cheese don’t count. We don’t have a cheese grater because Kelly doesn’t eat cheese (I don’t want to talk about it) and Molly buys pre-grated. This kitchen is just screaming for me to give it love. Add “cheese grater” to the list under my other necessary items like bundt pans and an immersion blender. So I had to chop it, which grossed me out a lot for some reason but it worked out fine for the casserole. I almost cried as I watched Kelly try to scrape the little morsels of cheese off the zucchini slices. 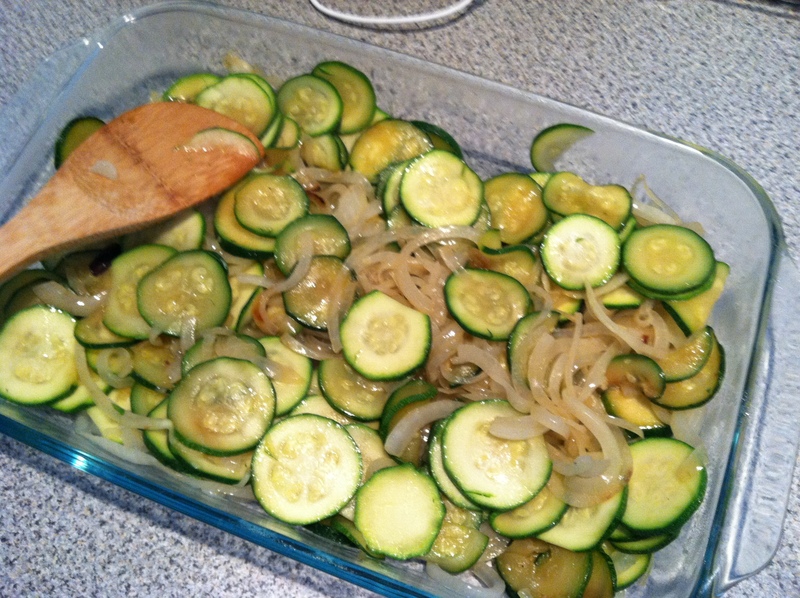 Saute the onions and zucchini in the butter until they’re slightly translucent. The onions take longer, so you can do those first and then put them into your casserole dish, add more butter, and saute the zucchini. Or if you have a big enough frying pan do it all together. Lightly beat the eggs. Add the milk, seasonings, and half of the cheese. Mix it together with the zucchini and onions and top with the remaining cheese. Bake at 375 for about 20 minutes. Indulge. Heat up the leftovers and drink the butter that remains in the tupperware. lol this looks amazing and you had me laughing the whole time I was reading this. Cheers!